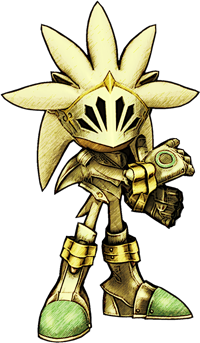 Sir Galahad is an alternate reality version of Silver the Hedgehog available in the multiplayer mode of Sonic and the Black Knight. Unlike Sir Percival, Sir Lancelot, or Sir Gawain, Galahad plays no part in the game's story mode. He and Sir Lamorak are presumed (but never explicitly stated) to have been part of the Black Knight's Knights of the Round Table. Sir Galahad is unlocked for multiplayer by beating the Lancelot Returns boss in Deep Woods. In Battle Mode, he does not actually physically hold his sword, instead wielding it via psychokinesis in a manner mimicing the abilities of his dimensional couterpart. In the real-world King Arthur/Holy Grail legends, Sir Galahad was the son of Sir Lancelot. Because of this, the similarities that Sonic fans noticed between Silver and Trunks (from Dragon Ball Z) were re-inforced, as Sir Lancelot was portrayed by Shadow, whose character heavily mirrors that of Vegeta. Hence, it is quite possible that Silver is Shadow's son from the future, but raises the question: "Who is Silver's mother?". Many of Galahad's voice clips were actually recycled from Silver's Sonic '06 dialogue.